To characterize Buried at Sea as an overwhelming sonic experience would be a significant understatement. To reference the crushing tides of sound waves that wash over the listener as the foursome drone on in perpetual tectonic slow motion would be to understate again. To mention the hopeless situation in which one finds oneself beneath tons of doom, volume, aggression, and bleakness is simply stating the obvious. Formed in Chicago in 2001, Buried at Sea quickly snared a viciously devoted cult following with honors, amongst the devotees, of being the loudest, the slowest, the doomiest, and the most crushing band on the planet. 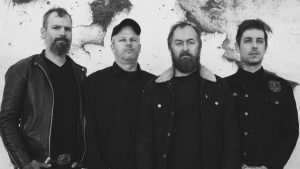 With only one brief tour which culminated at the now legendary 2004 Emissions from the Monolith Festival performance, the band has made its impact predominantly amongst the tape traders and file sharing communities. The few that have actually experienced the band live testify wholeheartedly to those feelings of hopelessness and helplessness. 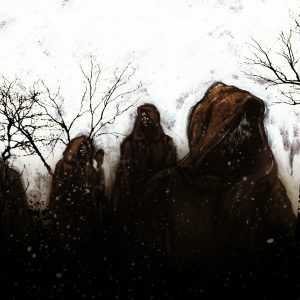 Buried at Sea’s first recording project, a 2002 demo, has since been passed around widely, containing the earliest material and foreshadowing the first proper release, which didn’t surface until late 2003. ‘Migration’, the band’s debut album released by Original Sound Recordings, was produced by guitarist and vocalist Sanford Parker at his Volume Recordings in Chicago in June of 2003. The subsequent attention led to the tour and the follow up release, a one-sided 12 inch record titled ‘She Lived for Others but Died for Us’. The record, which was released by Seventh Rule Recordings in June of 2004, contained a guest vocal appearance from Brutal Truth’s Kevin Sharp and a B-side etching from Stephen O’Malley. Since that time, Buried at Sea has remained largely dormant, lurking around Chicago and resurfacing from time to time. The album, ‘Ghost’, is a conceptual collection of recordings from 2005 and 2006 released on Neurot Recordings in October 2007. Again produced by Parker at Volume, this next chapter takes the form of a thirty minute ponderous and encapsulating journey littered with all the trappings that have been made infamous by their sound. Paced like a ghastly war march, and peppered with icy backdrops and more prominent electronics and psychedelic elements, ‘Ghost’ attests fully to the group’s overwhelming might while also making use of fresh dynamics and more story-like sinister subtexts.